Paul David Hewson, better known by his stage name Bono, is an Irish singer, songwriter, businessman and philanthropist. Hewson is best known as the lead vocalist and primary lyricist of rock band U2. He is the 2nd richest rock star in the world. As of 2019, Bono’s net worth is estimated to be roughly $700 million dollars. Paul David Hewson was born in Dublin, Ireland on the 10th of May, 1960. He is the son to Brendon Robert Hewson and Iris. He and his younger brother were raised in the Northside suburb of Finglas and the duo regularly attended the Church of Ireland services with their mother. Hewson joined the band u2 in 1976, where his peers gave him the nickname, ‘Bono Vox’, meaning ‘good voice’. Hewson began his musical career when he joined the rock band U2. He became the lead vocalist, and the band began touring and released its first album, ‘Boy’ in 1980. Seven years later, they finally gained international acclaim with their sixth album, ‘The Joshua Tree’. The 2004 album ‘How to Dismantle an Atomic Bomb’ brought the band both commercial success and critical acclaim. The tracks ‘Vertigo’ and ‘Sometimes You Can’t Make It On Your Own’ peaked the Billboard countdown and also won the band several Grammy Awards. In 2005, alongside with his wife, Bono established ‘EDUN’, a mission to substitute sustainable employment in developing areas of the world. On one such occasion in 2006, he began working with the band ‘Green Day’ to record a cover of the Skids, ‘The Saints Are Coming’. A few years later, U2 dropped ‘No Line on the Horizon’ which topped the American charts and the singles from the album such as ‘Get On Your Boots’ and ‘Magnificent’ featured in the top 10 list. As of 2019, Bono’s net worth is roughly $700 million dollars. View our larger collection of the best Bono quotes! In many interviews, U2 bandmates reveal how they debate extensively about their music products. Even though Bono is the leader and one would expect that he makes the final decisions pertaining to the band, he does not. Real leadership is when everyone else feels in charge. As a leader, it is important to evaluate your vision and the needs of your audience on an ongoing basis. If what you are trying to sell or propose does not resonate with your audience, you will likely not stay in business for too long. Leaders who win are those who foster a climate of camaraderie and togetherness within their team. Teams that are fraught with unnecessary competition, politicking, and division are too busy undercutting each other instead of helping to build a successful company. Bono is one of the most eminent singers and musicians of Irish origin and is best known as the lead vocalist of the rock band, U2. Bono is the 2nd richest rock star in the world, and there’s no doubt that he always will remain as an incredible rock icon. As of 2019, Boni’s net worth is approximately $700 million dollars. 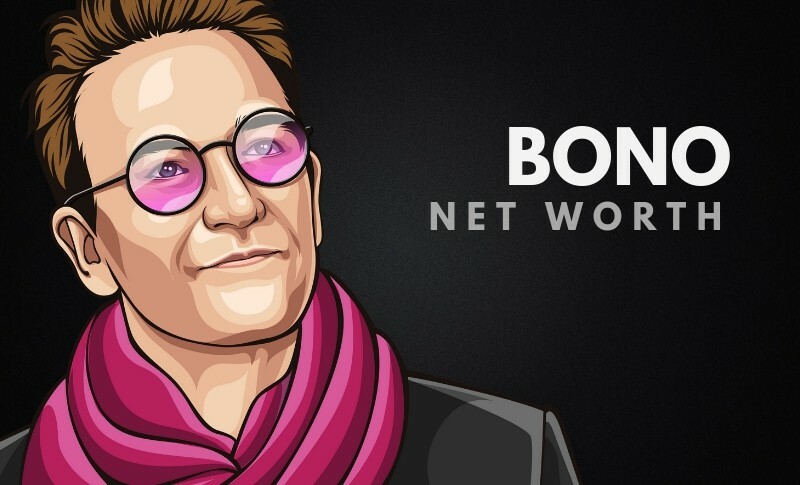 What do you think about Bono’s net worth? Leave a comment below.